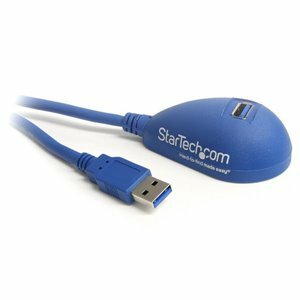 Extend a USB 3.0 port from the back of your computer to your desktop. The USB3SEXT5DSK Desktop USB 3.0 Extension Cable connects to an available USB female port on a Mac or PC computer, allowing you to relocate the USB (female) port up to 5-feet away from the computer case. By extending the USB 3.0 port away from the computer case, you can situate a USB 3.0 port from the computer in a more practical spot, such as on top of the computer case or on a desktop.Designed for next-generation SuperSpeed USB device connections, this USB 3.0 A-to-A Male/Female cable provides connectivity between a PC and hub or other USB devices, supporting a throughput of up to 5Gbps when used with a USB 3.0 host and device - an astounding 10x the capability of USB 2.0 (480Mbps).The 5ft USB 3.0 A to A desktop cable features high quality Shielded Twisted Pair (STP) construction, helping to prevent electro-magnetic interference and ensuring reliable data communication.